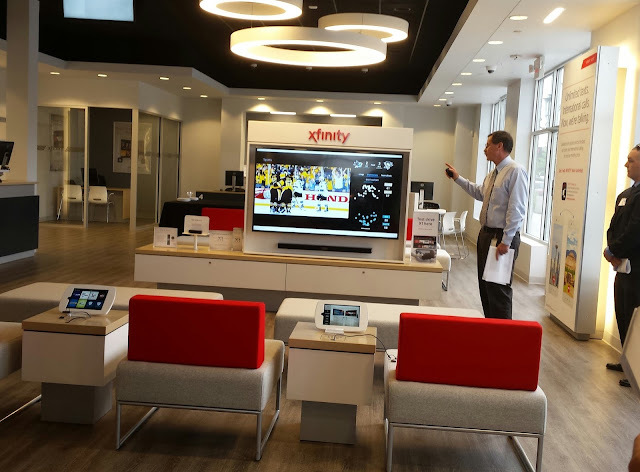 Bob Grove (Vice President, Public Relations of the Northeast Division and former Penguins Radio Network broadcaster) and Comcast hosted #XFINITYCUPFINAL, a blogger media event at the Xfinity store located at McCandless Crossing in North Hills. Bob demonstrated key features of the X1 Sports App, specifically the X1 Hockey app that has all the information you'll need for the Stanley Cup Final. NBC's Pierre McGuire, the man between the glass, was also in attendance to answer questions from the bloggers. 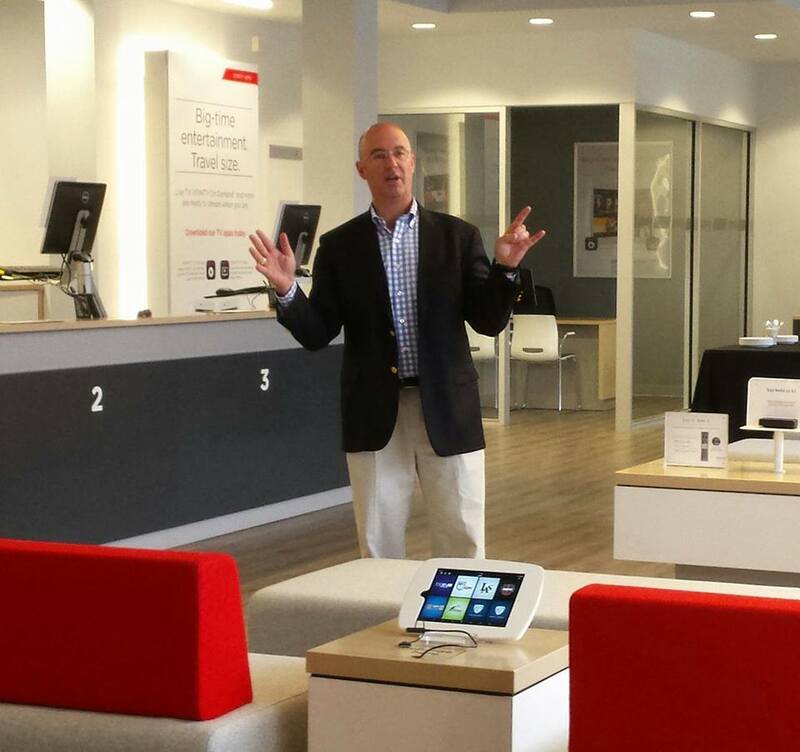 Before you start groaning, Pierre was very personable, knowledgeable and accommodating when answering our questions. I promise no one is paying me anything to say that. Bob showed us with the X1 Sports app, you can get pre-game and in-game stats for the game your watching all on the same screen. Everything pulls up on the right side of the screen, so there's no flipping back and forth. Sure, you can look up these stats anywhere but it's hard to argue how nice it is to look up stats without missing a minute of the action. Stats include each player's numbers for the regular season, current league ranking for goals, points, games played, plus-minus, game-winning goals and shots on goal. You can also access biographical info like height, weight, birthday and draft history. And it's easy to access with a voice controlled remote. For information on the X1 Sports app, visit the Xfinity website. Following the presentation Pierre answered questions about the Penguins past and current, the Stanley Cup Final, and some of his adventures during his career as a player, coach, scout and broadcaster. The amount of knowledge and information Pierre has in his head is impressive. He remembers more information than most people learn in a lifetime. He spoke fondly and candidly of his time as a scout and assistant coach with the Penguins in the early 90s. The most amazing performance he ever saw from Mario Lemieux was at a practice in Vail, Colorado, in 1991 after they had won the cup. They flew commercial to Denver (Mario even had middle seat) and were delayed for two hours. Vail was a two-hour bus ride from Denver. Bob Johnson was hospitalized at the time and the team was being coached by Scotty Bowman and the assistants. Despite the long day of travel, Bowman informs Pierre that he still wants the team to practice. When Pierre breaks the news to Lemieux, Mario said that was fine but they needed some food. So the bus stops at a fast food place, Mario runs in and goes back loaded with two big bags full of burgers and fries. Once they get to Vail and start practicing, Mario puts on a show that Pierre describes as the most amazing performance he's ever seen. "Poor Tommy Barrasso wishes he had been traded beforehand," Pierre said. "[Lemieux] was unbelievable. There's always a moment of the year where you think you have a chance to win the Cup, and that you have a good team. I knew right there. He was that good. He was amazing to watch." After Pierre had transitioned to broadcasting and was reporting for TSN, he was approached by an NBC executive at the 2004 Stanley Cup Final in Tampa Bay. During a commercial break the exec asks Pierre if he could broadcast the game from between the benches. Pierre said he could but there was no way the league would let him do it. The exec said to let them handle that part. "And that was my job interview," Pierre said. He started broadcasting between the benches after the lockout the following year. He says the spirit of cooperation from the players and the coaches has been unbelievable. Several coaches he's spoken to, like Ken Hitchcock, love it. It gives the coaches an opportunity to sell the game and you get a look inside their minds. They're telling you what they're going to do. Pierre specifically mentioned Hitchcock having fantastic soundbites this post-season. Because of the schedule, the San Jose Sharks have traveled more miles than any other team during the regular season. Conversely, Pittsburgh ranks above only Detroit for least miles traveled. The Penguins haven't left the Eastern Time Zone since January 18. Pierre says the Sharks' time zone travel frequency is the one advantage they have over the Pens. Their body clocks will be better prepared and the Pens may look a little off or sluggish at the start of Game 3. Peter DeBoer doesn't play a matchup game with his forwards, and Pierre thinks DeBoer will try to match Sid with Marc-Edouard Vlasic more throughout the series because of Vlasic's experience playing against Sid when they were in the QMJL. He also expects to see Burns and Malkin matched up more because Malkin is the Pens' biggest forward. On the flip side, Pierre says to look for Sullivan to try to match Sid with the Sharks' third-pair, defenseman Roman Polak. Sullivan gave it away during an interview with Pierre during Game 1 stating that the Pens have to get the puck behind the defense and challenge them with speed. Pierre said that Polak is a physical, robust, hard-edge player. The Pens are going to get him to "turn and go." After a strong showing from Justin Schultz in Game 1, look for the Sharks to challenge him more physically. The Sharks are familiar with Justin Schultz from his days in Edmonton, and Pierre thinks they're gonna go after Schultz. Prior to Jim Rutherford's hiring, Pierre confirms that he almost came to Pittsburgh to be the general manager. When he was interviewing with Lemieux and David Morehouse, Pierre outlined his strategy for revitalizing the Pens. He noted that the Pens have a plethora of prospects, but you have to make sure you keep the right guys. "Part of the problem with why this team dissipated is they either hold on to players too long, or get rid of players too early." When talking about what Rutherford and the Pens need to do to have continued success, I got the strong impression that Pierre would/thinks the Pens should move Marc-Andre Fleury in the offseason. He never specifically said Fleury, but you could hear it in the subtext when speaking about the core and cap space. Especially when he later brought up Matt Murray and mentioned Tristan Jarry's readiness. "You might have to let your core go. Some you may really like. You might have to do it. And if you trade an elite player, you better have a conversation with your players. You draft picks, your established players, your prospects." For all the complaining we do about Pierre and the other NBC analysts (myself included), I was beyond impressed with the time and attention he gave us. Bloggers aren't always taken seriously and we're not afforded many of these kinds of opportunities. At one point Bob suggested we wrap it up, and Pierre brushed him off saying he'd keep answering questions if we didn't have anywhere to be. 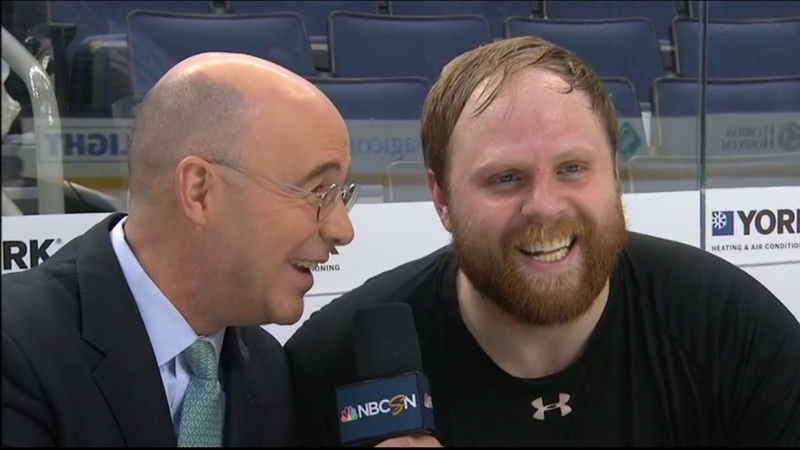 If Pierre's next interview hadn't shown up, I'm convinced that he would've stayed until midnight answering our questions. His generosity with his time and candid analysis will make me think twice before going off on Twitter about his latest asinine comment. We often forget that these broadcasters and analysts are real-life people and aren't always the boneheaded dummies they appear to be on TV. In case you're wondering - Pierre does refer to Letang as Kristopher in real life too.